Recognition of patterns of organ failure may be useful in characterizing the clinical course of critically ill patients. We investigated the patterns of early changes in organ dysfunction/failure in intensive care unit (ICU) patients and their relation to outcome. Using the database from a large prospective European study, we studied 2,933 patients who had stayed more than 48 hours in the ICU and described patterns of organ failure and their relation to outcome. Patients were divided into three groups: patients without sepsis, patients in whom sepsis was diagnosed within the first 48 hours after ICU admission, and patients in whom sepsis developed more than 48 hours after admission. Organ dysfunction was assessed by using the sequential organ failure assessment (SOFA) score. A total of 2,110 patients (72% of the study population) had organ failure at some point during their ICU stay. Patients who exhibited an improvement in organ function in the first 24 hours after admission to the ICU had lower ICU and hospital mortality rates compared with those who had unchanged or increased SOFA scores (12.4 and 18.4% versus 19.6 and 24.5%, P < 0.05, pairwise). As expected, organ failure was more common in sepsis than in nonsepsis patients. In patients with single-organ failure, in-hospital mortality was greater in sepsis than in nonsepsis patients. However, in patients with multiorgan failure, mortality rates were similar regardless of the presence of sepsis. Irrespective of the presence of sepsis, delta SOFA scores over the first 4 days in the ICU were higher in nonsurvivors than in survivors and decreased significantly over time in survivors. Early changes in organ function are strongly related to outcome. In patients with single-organ failure, in-hospital mortality was higher in sepsis than in nonsepsis patients. However, in multiorgan failure, mortality rates were not influenced by the presence of sepsis. Multiple organ failure (MOF) is an evolving clinical syndrome triggered by various stimuli and may be a consequence of tissue hypoperfusion with cellular hypoxia, metabolic dysfunction, and impaired bioenergetic processes . MOF is the main cause of morbidity and mortality in patients admitted to the intensive care unit (ICU) and is recognized as the final common pathway preceding death in critically ill patients [2–4]. Sepsis, a major public health problem, often progresses to MOF [2, 3], which is believed to increase markedly the risk of death in ICU patients [2, 3, 5]. A need exists to evaluate organ function better over time in ICU patients. The Sequential Organ Failure Assessment (SOFA) score [6–8] was developed as a tool to describe quantitatively the time course of organ dysfunction [9, 10]. Changes in SOFA score have been correlated with prognosis (delta SOFA and SOFA max) [8, 10] and are now widely used to assess the effects of therapeutic interventions [11, 12]. The aim of our study was to investigate the relation between the patterns of early changes in organ function in the ICU and outcome from critical illness. The study set up the hypothesis that recognition of early changes in organ function may characterize the clinical course of critically ill patients. Moreover, we explored the relative roles of sepsis and MOF in determining outcome in critically ill patients. This study is a subanalysis of the prospective, multicenter, observational study, the sepsis occurrence in acutely ill patients (SOAP) study, which was designed to create a database of ICU patients in European countries. Recruitment, data collection, and management are detailed elsewhere ; in brief, all patients older than 15 years admitted to the 198 participating centers (see the Acknowledgements for a list of participating countries and centers) between May 1 and May 15, 2002, were included. Patients who stayed in the ICU for less than 24 hours for routine postoperative observation were not included. Patients were followed up until death, hospital discharge, or for 60 days. Because the observational SOAP study did not require any deviation from routine medical practice, institutional review board approval was either waived or expedited in participating institutions, and informed consent was not required. As such, no supplementary review-board documents were needed for the current substudy. Data were collected prospectively by using preprinted case-report forms. Data collection on admission included demographic data and comorbidities. Clinical and laboratory data for the simplified acute physiology score (SAPS) II  were reported as the worst value within 24 hours after admission. Microbiologic and clinical infections were reported daily, as well as the antibiotics administered. 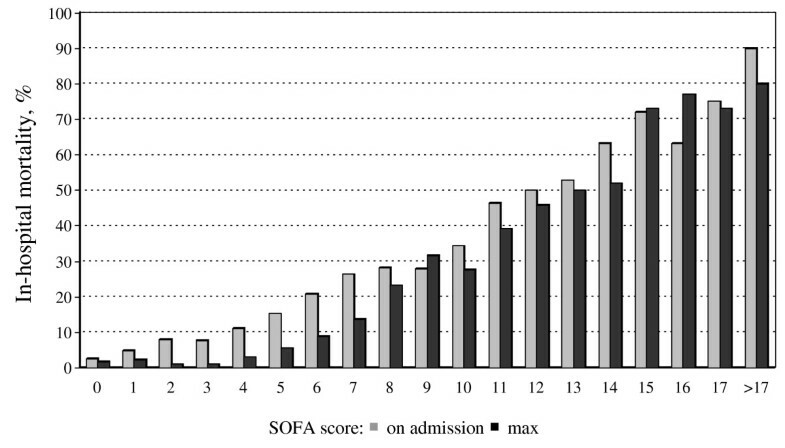 Organ function was evaluated on admission and daily thereafter, by using the SOFA score . Data were encoded centrally in the organizing center by medical personnel (Department of Intensive Care, Erasme Hospital), and a number of quality control measures were carried out to assure consistency of the data and the quality of data entry . All variables were defined a priori, and definitions were available on an Internet-based website throughout the study period. Sepsis syndromes were defined according to consensus conference definitions . Organ failure was defined as a SOFA score >2 for any of the six organs/systems evaluated, and MOF, as more than one failing organ . An increase in the SOFA score of at least 1 point was considered as deterioration in organ function. SOFAmax was defined as the maximum SOFA score recorded during the ICU stay, and SOFAmean, as the mean value during the ICU stay. Individual organ failures during the ICU stay were defined according to the SOFAmax for the corresponding organ. Combinations of organ failures were considered independent of the time of onset of each organ failure. The delta SOFA (ΔSOFA) was calculated as the difference between the SOFA score on a specific day and the score on the day of admission to the ICU . For the purposes of this analysis, we excluded all patients who spent less than 48 hours in the ICU. To investigate the impact of sepsis on organ failure, patients were divided into three groups; Patients without sepsis, those in whom sepsis developed within 48 hours after ICU admission, and those in whom sepsis developed more than 48 hours after admission to the ICU. Data were analyzed by using SPSS 13.0 for Windows (SPSS Inc., Chicago, IL, USA). Descriptive statistics were computed for all study variables. The Kolmogorov-Smirnov test was used to verify the normality of distribution of continuous variables. Nonparametric tests of comparison were used for variables evaluated as not normally distributed. Difference testing between groups was performed by using the two-tailed t test, Mann-Whitney U test, χ2 test, and Fisher Exact test, as appropriate, with a Bonferroni correction for multiple comparisons. Differences in SOFA scores between groups over time were assessed by using multifactorial analysis of variance (ANOVA). Continuous data are presented as mean ± SD, and categoric data, as number (%), unless otherwise indicated. All statistics were two-tailed, and a P < 0.05 was considered to be statistically significant. Of the 3,147 patients included in the SOAP database, 2,933 patients stayed in the ICU for more than 48 hours (Table 1). The admission SOFA score for these patients was 5.0 ± 3.7; the maximum SOFA, 6.6 ± 4.4; and the mean SOFA, 5.0 ± 3.7. The median ICU length of stay was 3.4 (IQ, 2.0 to 7.6) days, and the median length of hospital stay, 16 (8 to 33) days. The overall ICU and hospital mortality rates were 16.6% and 21.9%, respectively. aSeven missing values; b292 missing values; cone missing value; d44 missing values. On admission to the ICU, 1,675 (57.1%) patients had at least one organ failure; these patients had ICU and hospital mortality rates of 27.6% and 34.2%, respectively. In total, 435 (15%) patients developed organ failure in the ICU. The organ failures most commonly present on the day of admission to the ICU were of the cardiovascular (24%) and respiratory (22%) systems, whereas respiratory (43%) and renal (36%) organ failures were the most prevalent during the ICU stay (Table 2). The combination of respiratory and cardiovascular organ failures was the most common on admission (9%) and during the ICU stay (25%). aAlone or in combination with other organs. Hospital mortality rates increased according to the severity of organ dysfunction/failure as assessed by the SOFA score (Figure 1) and according to the number of failing organs (Table 2). The highest hospital mortality rates were observed in patients with failure of the hepatic or coagulation systems, and in patients with combined coagulation and hepatic or coagulation and central nervous system (CNS) failure, mortality rates reached 70% to 80%. Hospital mortality rates according to SOFA score on admission (gray columns) and the maximum SOFA score (black columns). The time to achieve SOFAmax was longer in nonsurvivors than in survivors (2 (2 to 3) versus 1 (1 to 2) days; P < 0.001). Patients who exhibited an improvement or no change in organ function over the first 24 hours after admission to the ICU had lower ICU and hospital mortality rates compared with those whose scores increased (12.4 and 18.4% versus 19.6 and 24.5%; P < 0.05 pairwise). Likewise, patients who exhibited an improvement or no change in organ function over the second day in the ICU had lower ICU and hospital mortality rates compared with those whose scores increased (13.8 and 20.7% versus 18.6 and 24.1%; P < 0.05 pairwise). Delta SOFA scores were higher and remained higher in nonsurvivors than in survivors over the first 4 days in the ICU; they decreased significantly over time in survivors (Figure 2). Error bars representing the delta SOFA scores (mean ± 95% CI) during the first 4 days in the ICU in survivors (solid circles) and nonsurvivors (solid triangles) in the whole cohort (A) ( n = 2,933) and in patients without ( n = 1,789) (B), or with sepsis ( n = 1,144) (C). *P < 0.05 compared with ΔSOFA 24-0 (ANOVA with Bonferroni correction for multiple comparisons); †multifactorial ANOVA; P < 0.05 compared with survivors. In total, 1,144 (39%) patients had sepsis at some point during the ICU stay, including 865 during the first 48 hours in the ICU and 279 after 48 hours. MOF occurred more frequently in patients with sepsis, irrespective of the time of onset (Table 3). During the ICU stay, renal failure was the most common organ failure in patients who never had sepsis, and respiratory failure was the most common in patients with sepsis. CNS, central nervous system; IQ, interquartile range. bP < 0.05; aP < 0.01 compared with patients without sepsis (pairwise comparisons with Bonferroni correction for multiple comparisons). ICU (24 and 28 versus 11%; P < 0.001 each) and hospital mortality rates (33 and 33 versus 14%; P < 0.001 each) were more than double in patients who had sepsis within or after 48 hours than in those who never had sepsis. Mortality from any type of organ failure was higher in patients with sepsis than in those who did not have sepsis, irrespective of the time of onset (Table 4). Hospital mortality rates in patients with single-organ failure during the ICU stay were higher in patients with sepsis than in those who never had sepsis (sepsis within 48 hours and sepsis after 48 hours versus no sepsis: hospital mortality, 16 and 13 versus 9%, respectively; P < 0.01 pairwise). However, patients with MOF had similar mortality rates regardless of whether they had sepsis (ICU mortality ranging from 23% to 76%, and hospital mortality ranging from 32% to 89%). Delta SOFA scores over the first 4 days in the ICU were higher in nonsurvivors than in survivors, regardless of the presence of sepsis (Figure 2). SOFA scores remained elevated in survivors but decreased over time in survivors, irrespective of the presence of sepsis. 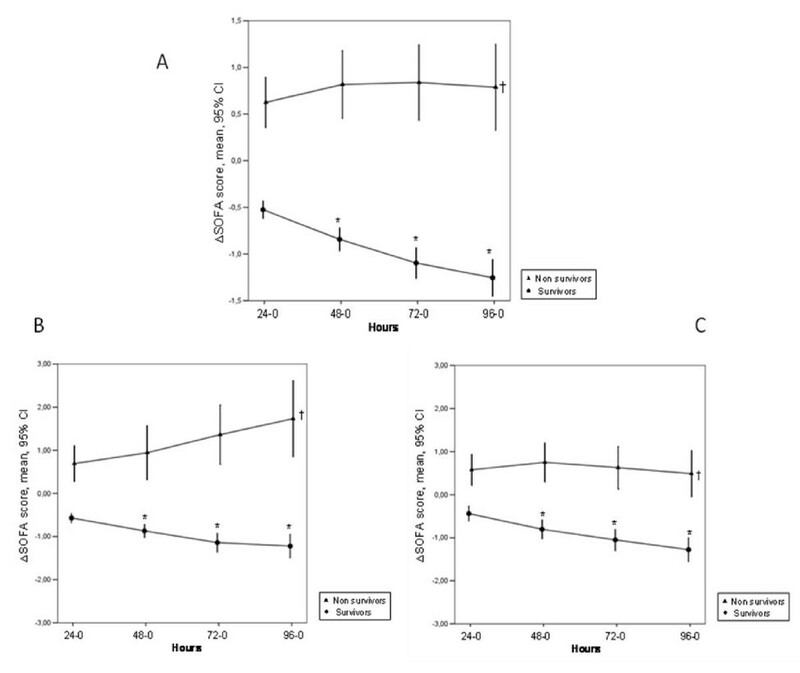 The main findings of our study were that (a) whatever the degree of organ failure at ICU admission, patients who exhibited an improvement or no change in organ function during the first 24 to 48 hours in the ICU had lower mortality rates than did those in whom organ function worsened; (b) in patients with single-organ failure during the ICU stay, hospital mortality was significantly greater in patients with sepsis than in those without; (c) patients with MOF had similar mortality rates, regardless of the presence of sepsis. The association between early improvement in organ function and favorable prognosis has been reported in several other studies [8, 15, 16]. In 287 patients with severe sepsis, Russell et al. reported that worsening of organ function over the first 3 days after the onset of sepsis syndrome was associated with higher 30-day mortality rates than was improvement or no change in organ function. In a study of 1,036 patients with severe sepsis, Levy et al. also reported that early changes (baseline to day 1) in organ function were closely related to outcome. Interestingly, we found that the evolution of organ function on the second day in the ICU was associated with outcome, irrespective of the degree of organ function on admission to the ICU. These observations may help to identify patients in whom continuing therapy is likely to be futile , or to define patients who may benefit from a change in therapeutic strategy (for example, another surgical intervention, a change in antibiotic therapy, or more-intensive vasoactive support). We found that the time required to achieve the highest degree of organ dysfunction/failure was shorter in survivors than in non-survivors. However, no specific pattern of organ failure was related to the presence of sepsis in our patients. Dulhunty et al. reported that CNS dysfunction was more commonly present in patients with systemic inflammatory response syndrome (SIRS) but no infection and was associated more commonly with death in these patients than in those with sepsis. However, the assessment of neurologic failure using the GCS may be confounded by the frequent use of sedative agents in critically ill patients. Several studies [3, 6, 16, 19] have investigated the epidemiology and outcome of sepsis-associated organ dysfunction/failure; however, studies in the nonsepsis population are scarce [4, 18]. Dulhunty et al. investigated the time course of organ dysfunction and outcome in patients with severe sepsis and patients with severe noninfectious SIRS, but excluded all other patients, which may explain the higher ICU mortality rate of 25% in their noninfected population, compared with the 20% in our study. In our study, hospital mortality from single-organ failure during the ICU stay was greater in patients with sepsis than in those who never had sepsis; interestingly, mortality rates from MOF were similar, regardless of the presence of sepsis. In their large cohort of ICU patients in Australasia, Dulhunty et al. reported similar findings. Interestingly, the highest hospital mortality rates were observed in patients with failure of the hepatic or coagulation systems. Because disturbances of coagulation parameters are closely related with liver failure, this study highlights the enormous importance of liver function on the outcome of ICU patients. Umegaki et al. also recently reported that hepatic dysfunction compared with other organ dysfunction was associated with the highest mortality rates in a study including 4,196 patients with severe sepsis. A key strength of our study is the large database of patients and its multicenter, pan-European nature. The SOAP study was performed several years ago, but organ-dysfunction patterns are likely to change slowly over time, so these data are still relevant. Nevertheless, our study has some limitations. First, participation was on a voluntary basis. Second, our results can be extrapolated only to ICUs with a similar case-mix. Third, other factors, which were not considered in our report, may influence the outcome of MOF, including comorbidities, severity of illness, and local practice. We also did not discriminate between acute and chronic organ failure in our analysis. Although sepsis patients have worse outcomes than do nonsepsis patients, the differences are primarily in patients with only one organ failure, as the mortality in MOF is very high, regardless of the presence of sepsis. In all patients (with or without sepsis), changes in organ function during the first 24 to 48 hours after ICU admission can determine outcome, irrespective of the baseline degree of organ dysfunction. These patterns of organ failure and their relation to outcome may be useful in prognostication and, hence, in risk stratification of critically ill patients, including in the setting of clinical trials. Whatever the degree of organ failure on admission to the ICU, patients who exhibited an improvement in organ function during the first 24 to 48 hours in the ICU had lower mortality rates than did the other patients. Higher mortality rates in sepsis compared with nonsepsis patients are primarily the result of higher mortality associated with single rather than multiorgan failure. Mortality rates in patients with multiorgan failure are high, irrespective of the presence of sepsis. Improved knowledge of patterns of organ failure and their relation to outcome may be useful in prognostication and, hence, in risk stratification of critically ill patients. JLV conceived the initial SOAP study. RM, HG, VMR, YS, and JLV participated in the design and coordination of the SOAP study. YS performed the statistical analyses. SL, YS, and JLV drafted the present manuscript. RM, VMR, AG, YS revised the draft. All authors read and approved the final manuscript.